“…words will never hurt me.”…Not really. There were no better words I could start this piece with than these. The magnificent work of Shane Koyczan’s spoken word poem ‘To This Day’ can pierce through the hardest of hearts and leave an everlasting mark on anyone who cares enough to listen. I have been contemplating writing about bullying for a while now, and I just couldn’t bring myself to. Having gone through a phase of it for the longest time growing up, it brought back quite a few repressed childhood memories every time I decided to sit and write. But I know it’s important, and it has helped shape the woman I have become, for better or for worse. I also know that there could be someone out there who needed words to describe how they felt, and if mine could be the ones that help them, I would feel a sense of fulfilment in doing what I could. I know it could make a difference; I’ve had a fair share of writers do the same for me. Especially after writing my recent post on “What are you afraid of?”, I knew it was time for me to write what this made me feel. So many parents used to think that bullying builds character. Zack W. Van says “Bullying builds character like nuclear waste creates superheroes. It’s a rare occurrence and often does much more damage than endowment.” I couldn’t have put it better myself. I’d go so far as to say that most of the horror stories we hear of bad people in this world is probably to do with a bad childhood and had some influences of bullying somewhere. This is why when kids come home and say they’re having troubles, they need to be taken seriously. I was too scared to say anything to my family because some of the people that called me names were a part of it, apart from the “friends” I had. I briefly fought back, but realised it turned me into a bit of a bully too, and that I wasn’t proud of. So I broke away from all those toxic people and started rebuilding myself, piece by broken piece. I hit rock bottom before I tried to surface up, though. 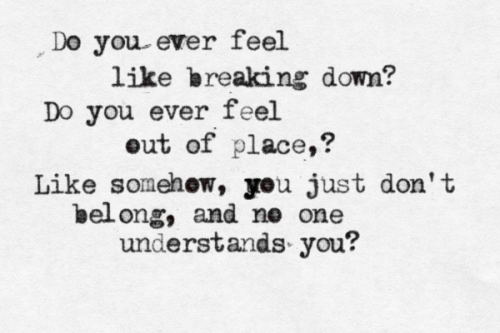 These words from Simple Plan’s song ‘Welcome to My Life‘ perfectly summarise how every victim of bullying feels. When most people meet me today, they see a confident, happy woman. An attractive woman, even, some have told me. A woman full of life, laughter and hope. Hope. That’s what they get from me too, to hope for the better things; to hope for change. This confidence, this yearning for hope, this faith in things getting better – it’s a by-product of years of being made to feel the opposite. I was the one that hid in the shadows; that wasn’t “enough”. I could never amount to much, because I didn’t have what it took. Things couldn’t change, because let’s face it, have I observed myself closely? No one could really love me, because there are way more prettier women around, clearly. No one ever said things to me directly, but enough and more of this was subtly tossed my way. So subtly in fact, that I did not see it creep slowly into my soul, poisoning it to believe I wasn’t worth the time of the day to anyone. Shane K says this really well in the rest of the poem, and that is why it strikes such a chord with me. It can break people, particularly kids, really easily. And sometimes you aren’t fortunate enough to ever recover, and you’re scarred for life. Or worse, even. But that may never be enough when you are left with a damaged soul. You’re too scared to let anyone in, because what if they pull you down from all the progress you’ve made? What if they tear down the person you’ve managed to heal yourself and turn into? Of course, at this point, you will only know by taking that risk and letting them in. Or you used the scars you have had to deal with and turn it into something positive. Become a force so strong, that everyone knows you’re one to be reckoned with. Help heal all those broken souls you can find and set them on their way to greatness. Help them discover the beauty that is them, inside and outside. And then, you will free yourself from the shackles that held you back, all that didn’t let you soar to the heights you were meant to reach. What if the one you bullied ends up being the only one who can possibly save your life?